Skien - Morning temperatures will be around 2 °C. During the day they will reach a maximum of 16 °C. On Vær Sentral Norway you will find current weather data, local weather forecasts and a treasure of useful information around weather. Thanks to our high-resolution weather radar and current severe weather warnings there will be no nasty surprise any more. Norway extends over 13 degrees of latitude, from 58 to 71 degrees north. Thus, it shares the same latitude with Alaska, Greenland and Siberia. Despite its geographic location, the climate in many Norwegian regions is more pleasant than one might expect. The most important reasons therefore are its location in the westerlies and the influence of the northernmost extensions of the gulf stream. The largest annual temperature differences are found in the regions north of the arctic circle (66.56 degrees north). On the Finnmark plateau, average temperatures lie around -16 degrees. A record value of -51.4 degrees was measured on 1 January 1886 at the station Karasjok. In the inland regions of the Østlandet temperatures below -40 degrees are possible as well, they do not occur every winter, though. 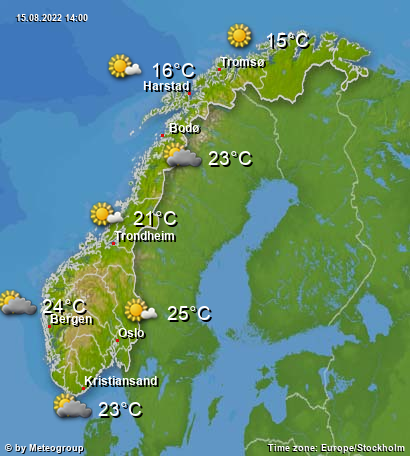 In summer, however, temperatures may rise above 30 degrees even in the far north of Norway. As a result, a temperature span of more than 50 degrees between summer and winter is not uncommon. With almost 84 degrees, the largest annual temperature amplitude was measured in Karasjok. In the coastal areas moderate climate prevails. In Bergen, the average winter temperature lies around 1 degree. In Lofoten, despite being situated much farther north, it is only slightly cooler with 0 degrees. During the summer months, temperatures reach 10 to 14 degrees on average on the west coast. The warmest regions are Østlandet and Sørlandet. Because of the mild winters, the highest annual mean temperatures are found on the western and southern coasts of Norway. The annual mean temperature in Lindesnes is 7.7 degrees. The coldest region is the Finnmark plateau with an average temperature of -3.1 degrees in Sihccajavri. The Scandinavien mountains, ranging from the Skagerrak coast in the south to the Nordkap, have a major influence on Norway's climate by blocking the humid air masses from the Atlantic Ocean. Accordingly, most precipitation occurs on the west coast, especially in the region between the Hardangerfjord and the province of Møre og Romsdal.The annual precipitation amounts measured in this area are among the highest in Europe. Brekke in Sogn og Fjordane county has an average annual precipitation of 3575 liters per square meter, whereas fall and winter account for two thirds of these amounts. The driest regions are in the lee of the mountains as well as in the provinces in the far north of Norway. The average annual precipitaion amount in Øygarden (Provinz of Oppland) is 278 liters per square meter, which is less than some of the monthly sums of Brekke! Dividalen (Troms) and Kautokeino (Finnmark) with annual amounts of 282 and 360 liters per square meter, respectively, are also worth mentioning.